A great side dish for your dinner or for a light and tasty lunch. I’ve become addicted to Pinterest. I’m probably the last person on earth to become addicted because for a long time, even though I knew it was there, I didn’t go on it very often. I’m on it every day now. If I’m sitting somewhere waiting, I click on the app on my phone and I just scroll and pin, scroll and pin. I’ve found many wonderful ideas for many wonderful things, many of which I’ll probably never have the opportunity to try out. But, I’ve pinned them for future reference, just.in.case. One such pin that I scrolled past actually did come to fruition, and it was a delicious success, so I thought I’d share it with you today for my WFDW post even though it’s not just for dinner. 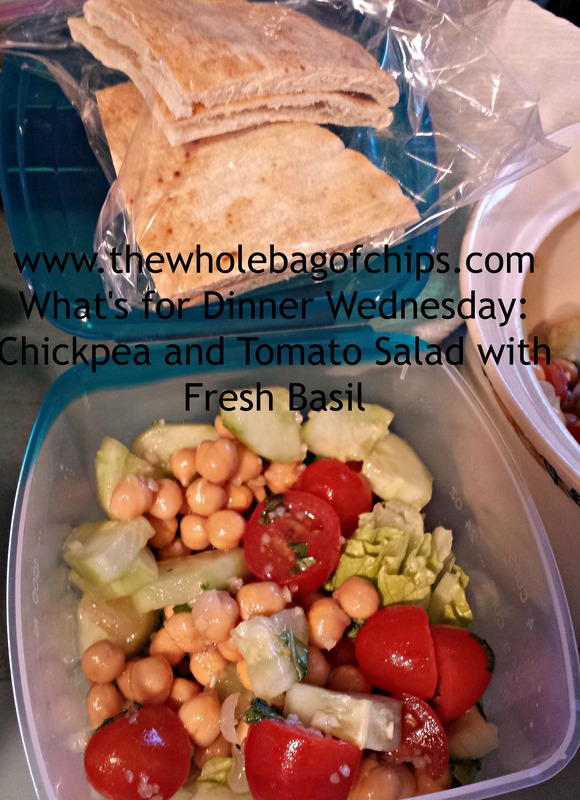 This recipe for Chickpea and Tomato Salad with Fresh Basil came my way via the Green Lite Bites site, and I appreciate them sharing it because it’s a simple recipe with fresh ingredients, and I will definitely be making it again in the future. Interestingly enough, on the day I saw this pin on Pinterest, I actually had a can of chick peas sitting on my kitchen counter. I’m not sure who put them there or why, or what the original intention for them was, but they’d been there a while and I’d been thinking of roasting them one afternoon for a snack, since I hadn’t done that in a while. Additionally, we’d been babysitting my parents’ plants while they were away and one of them was a fresh Basil plant that they’d left us and told us to feel free to use it if we wanted to. So, I had fresh Basil, which I never do, I had chickpeas, which I often don’t, and I had tomatoes, which I always do. I had everything I needed for this recipe. I also had two cucumbers that needed to be used, so I decided when making this recipe, to add one in as well. This was going to be on our menu for lunch during the work and school week, so I decided to give my morning a break by making it ahead of time and putting it in the fridge overnight. I also felt that the flavors would have a good amount of time to blend together and everything would be perfectly chilled by morning. Four out of five of us were having this for our lunches. For two of my daughters, having just this in a bowl was plenty, along with some pita bread cut into triangles on the side. For my husband, we opted to put this salad onto a bed of lettuce, (as I’ve shown here) with the same side of pita bread. There was just enough left for me to have a little bowl on the side with my lunch that day too. Everyone loved their lunches and it was just enough for everyone’s desired portion sizes. I loved having my morning “off” from making all four lunches from scratch and I loved coming home to my own lunch partially decided for me, and waiting to be eaten. I don’t love lunches to begin with and I hate deciding what to have. This was a nice treat for us all. The recipe is quick, can be modified to add in or take out ingredients based on your own tastes and what you have on hand. You could throw in some fresh mozzarella cheese balls (although that would make it a little less healthy if you did) and it’d be just as delicious. Here is the recipe just as it’s shown on the Green Lite Bites site. I hope you’ll pay her site a visit, as there’s lots of other healthy options to try! I loved the texture and flavor of this recipe! ORIGINALLY POSTED JANUARY 15, 2014: Recently my friend Melissa shared a recipe that came through Facebook. Although Facebook is a great place to find and share recipes, you can’t always be sure where the recipe truly originated, so it’s hard to credit someone. 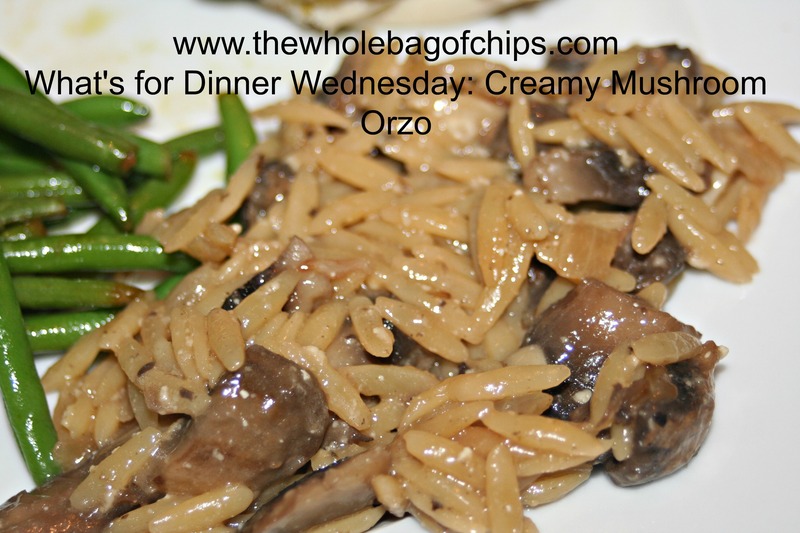 It seems as this recipe for Creamy Mushroom Orzo may have originated on the page of Sharon Fox, who lists herself as author, food editor, radio personality and personal chef. However, even she says that the recipes found on her page are not from her own cookbooks, but are recipes she’s tried and loved. But, we do the best we can. I always like to give credit where credit is due, if I can. No matter what, I’m so glad that someone, somewhere, originally made and share this recipe! I really loved it. I used it as a side dish for a kind of “boring” meal that we were having and to me, it made my meal so much more exciting. The kids did not love it quite as much and I think it’s because it calls for white wine and it really holds the flavor. I think that’s why I loved it so much!! The recipe was fast, easy to make, and delicious; all my top qualifiers for a recipe. I’m sharing it here, give it a try if you’re looking for something to jazz up one of your own meals! This was an easy-to-make recipe, fast and delicious! 1.In medium sized skillet, heat oil over medium heat. Add chopped onion and garlic. 2.Stir, cooking until onions are golden and soft. 3.Add orzo, mushrooms, Worcestershire sauce, sage, and butter. Cook, stirring about 5-6 minutes until mushrooms are tender. 4.Pour both chicken broth and wine into orzo mixture. Bring broth to a boil. 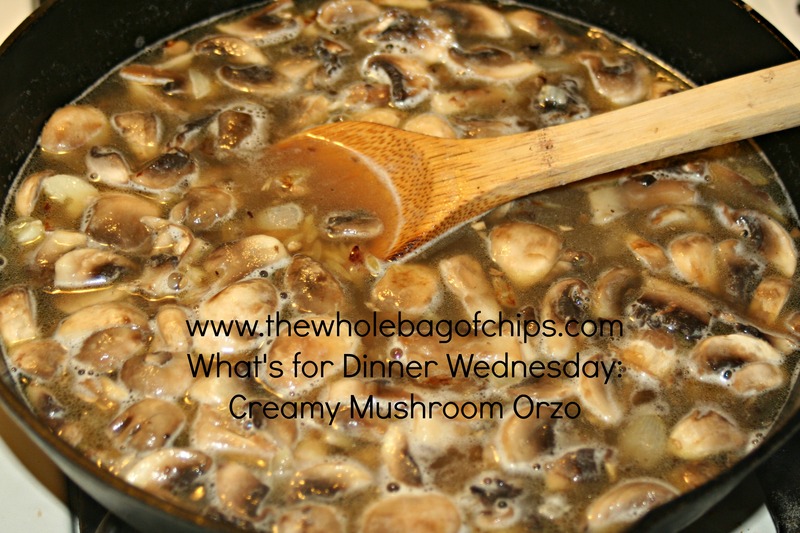 Stirring often cook 10-15 minutes or until orzo is soft and liquid is absorbed. 5.Stir in Parmesan cheese before serving. Three soups that are quick, easy and can all be done simultaneously. Earlier in the school year I did quite a bit of food preparation ahead of time, making and freezing foods for future use. One thing I’d wanted to do but hadn’t had time to do, was make and freeze some soup. Recently when I had one child home sick for an extended amount of time, I had an afternoon where I’d have a couple of hours to make some soup. The only question was, what kind of soup? Everyone has a favorite. I love cream of broccoli and creamy cauliflower soup, as does my oldest daughter, who happened to be the one home sick. But, my other daughters and my husband, they love the cream of tomato soup that I’ve been making lately and my middle daughter in particular had been asking for it quite often. When I thought about the recipes though, they were all pretty similar. Other than the actual vegetable for each soup, namely broccoli, cauliflower and tomato, the base ingredients and instructions were all pretty similar: onion and chicken broth. The tomato soup had a few extra spices thrown in, and the broccoli soup had celery added in and some milk and flour at the end, but ultimately I realized that I could actually make all three at the same time, almost like an assembly line: cut up all the onion, divide it into the soup pots, cut up each veggie and add them in, and then simmer. If any additional steps or ingredients were needed, it wasn’t all that hard to do. Nothing was complicated, expensive or time-consuming. In an hour I’d be done. The tomato soup has an option to put in tortellini and shrimp at the end, but this time around I was doing it without those last two ingredients mostly because that is what had been requested. 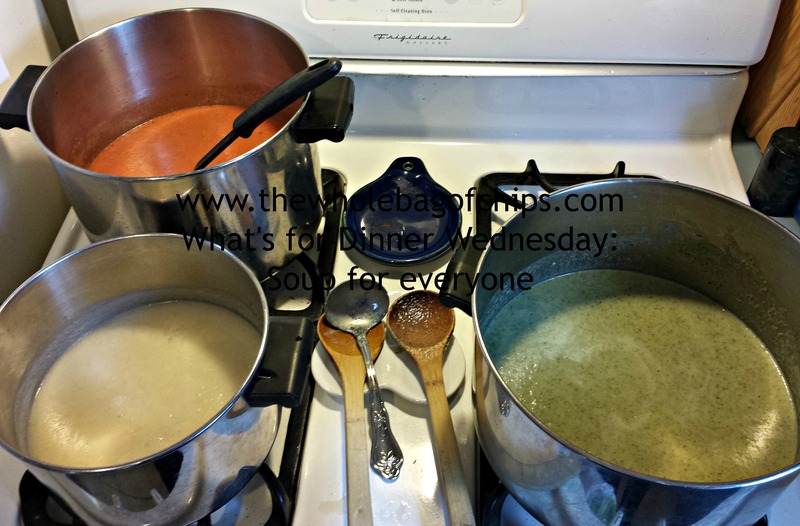 Just like that…three soups, done and everyone’s taste buds were happy!! Although I cried a lot of tears cutting up all those onions, overall it was a great experiment and all went off as planned. I had enough soup for whoever wanted whatever kind they wanted over the next couple of days, and then using quart-sized bags, I froze the rest. We already had a cold, rainy Sunday afternoon where a few of us had soup for lunch from the freezer, and there’s still more for whenever we need it, whether it’s for an after school snack, a lunch or a dinner where someone doesn’t like what’s on the regular night’s menu. 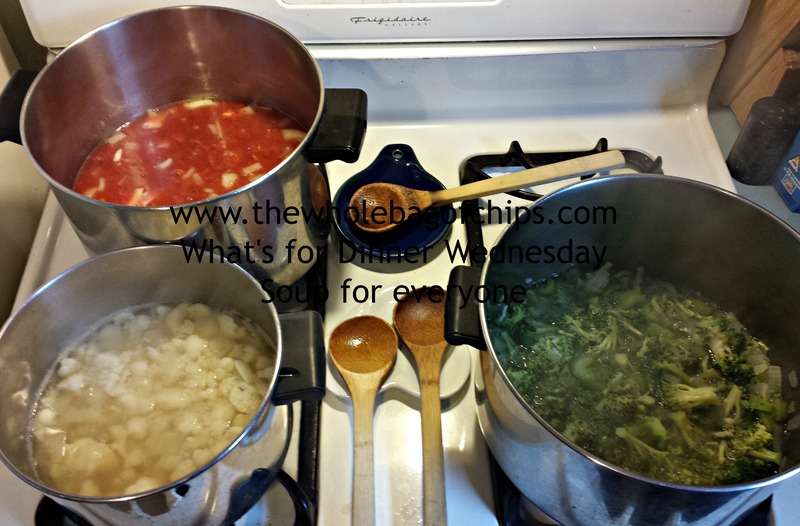 Since these soups have already been featured on my blog, I’m putting the links below so that you can refer to them if you’d like to make any or all of them for yourself. The weather here is starting to cool down and it will be nice to have some soups for the upcoming chilly days and nights ahead! Here are the links for you. If you’d like to make the Cream of Broccoli Soup, click here. If you’d like to make the Creamy Cauliflower Soup, click here. If you’d like to make the Creamy Tomato Soup, click here. These were healthy and a huge hit. Definitely a keeper. I love that old adage. You cook once, and live on the leftovers. Or, you make double, since you’re cooking anyway, and have twice as much. I’ve been living on that theme all week long. I’ve been a cooking machine this week, in between my own work hours, trying to deal with our crazy school year schedules, and making sure that we maintain a healthy eating lifestyle at the same time. Really, just making sure everyone’s got something to eat when it’s time to eat. However, one thing I really enjoy doing is making great after school snacks for my kids whenever I can. Everyone has something that makes them happy, and I think I’ve inherited my grandparents’ genes. My dad always said that my grandmother was happiest when everyone was eating. If everyone is eating, they’re happy, and that makes me happy. To me, as a mom, there is nothing more special than the moment the kids walk in the door from school. They’re tired, they’re hungry, they’ve got more work to do or places to go, but the look on their faces when they smell a snack fresh out of the oven or see it on the table is priceless to me. I feel like I have the ability to make their day, every day. Or almost every day. I do the best I can. Later on in life, I want their memories of their school years to include coming in from school, and finding me there with something tasty for them to snack on. Some days I’m not even there, my schedule is not always consistent, but I’ve left them a tasty snack and a note on my way out the door. To me, it’s things like that which make all the difference. Everyone loves these whether for breakfast or after school or a meal on the run. Additionally, I try to think smarter these days. If I’m going to make an after school snack, I might as well make enough of it to last for more than just one afternoon. I have tried to make things that can be used either as lunchbox snacks or as breakfast the next day. 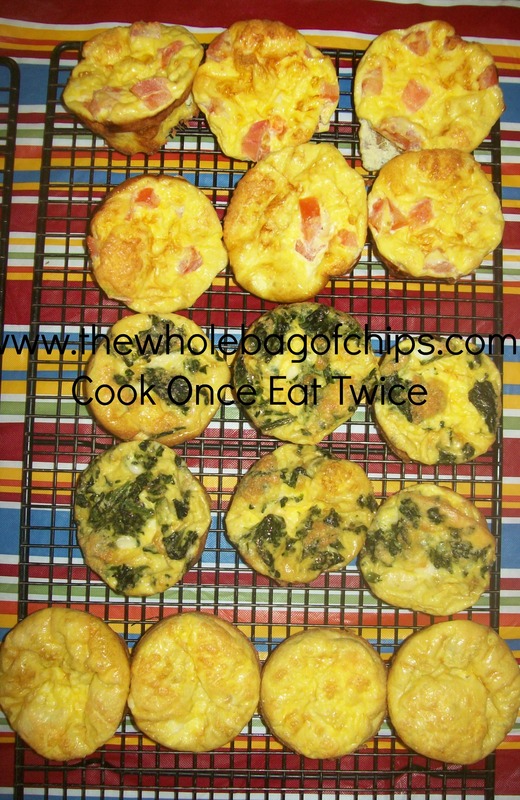 These little mini quiches, or however you’d describe them, make a great after school snack. They’re healthy and you can make all different varieties to satisfy even the pickiest of eaters. This time I did tomato/egg/cheese, spinach/egg/cheese and just plain egg/cheese. Fifteen eggs made 16 good-sized cups. They were a snack and they’ve been breakfast or lunch throughout the week as well. The pumpkin muffins, pictured above, I doubled the recipe to make twice as many. They served as an after school snack, breakfast the next day and a lunchbox snack the day after that. If I’m going to work hard, I might as well get the mileage out of my efforts. 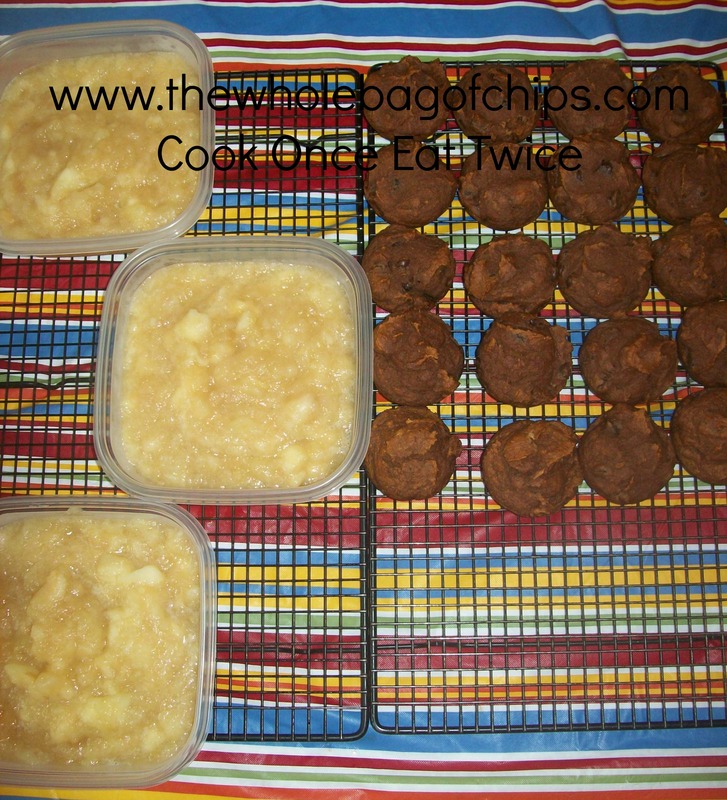 On that same afternoon this week as the pumpkin muffins, I also made a big batch of homemade applesauce. If I’m going to stand there and peel three pounds of apples, I might as well peel six pounds (although I have to stop there or my hand aches from all the peeling and slicing). I used one batch in a recipe that night, froze two batches in my freezer for future use, and had some leftover to serve on the side with dinner as well. There’s nothing like homemade applesauce, especially in the fall in New England. 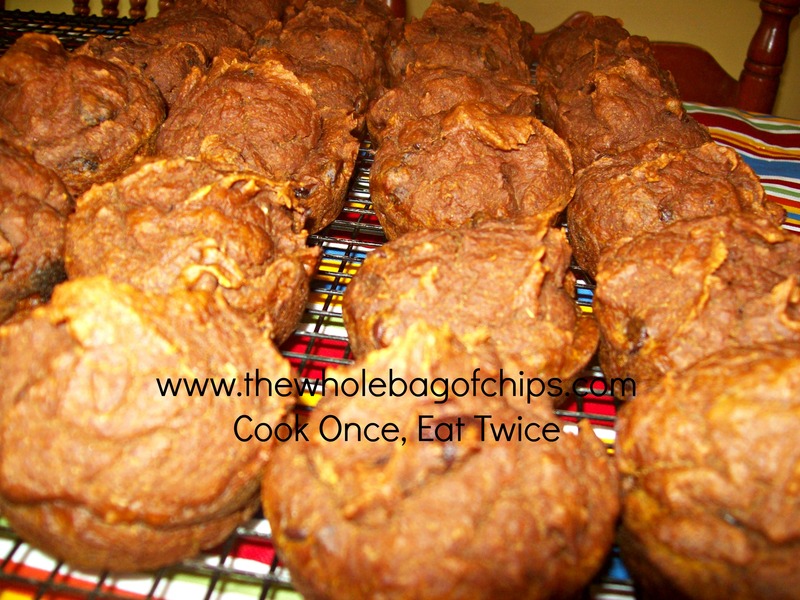 Today, I’m going to share with you the recipe I found for these delicious pumpkin muffins. Note that the recipe calls for mini chocolate chips. I don’t *do* mini chocolate chips. If I’m going, I’m going all the way so mine had regular-sized chips. Otherwise, the recipe I made was the same, just doubled. This recipe is not my own. Thanks to Skinnytaste.com for posting such a wonderful snack and breakfast! It got all thumbs up at our house and we’d definitely make these again! If I’m going to spend the time, might as well make it worth my while. As a lover of loaded baked potatoes with bacon and cheese, I loved this recipe! Potato Salad: a summertime menu staple. I love that and a good old pasta salad in the summer. When I saw a recipe from Caramel Potatoes, one of my favorite recipe blogs, for Loaded Baked Potato Salad, I was totally inspired. Bacon + Cheddar = two of my favorite savory add-ons and mix-ins. It sounded good! It sounded like my favorite kind of loaded baked potato. I decided that the next time we made a potato salad, we’d do our own version of the Caramel Potatoes recipe, by adding on some shredded cheddar cheese and crumbled cooked turkey bacon. As you’ll see in their original recipe here, you can do a zesty Ranch flavored potato salad, or you can do as we did and just add the toppings. Our potato salad has mayo and hard boiled eggs in it, so I felt that the zesty flavorings might not be a good fit with our ingredients and I kept it simple. When I think summertime, I think potato salad! 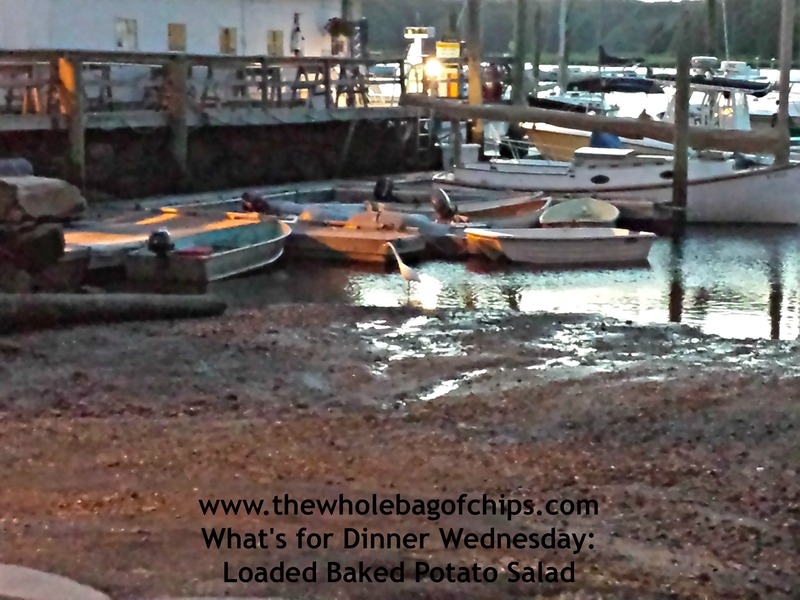 We brought our side dish to a potluck party held near the water on a perfect summer evening and it got positive reviews, although some said they preferred a traditional, plain potato salad rather than a loaded potato salad. So I’m now curious! What’s your opinion? 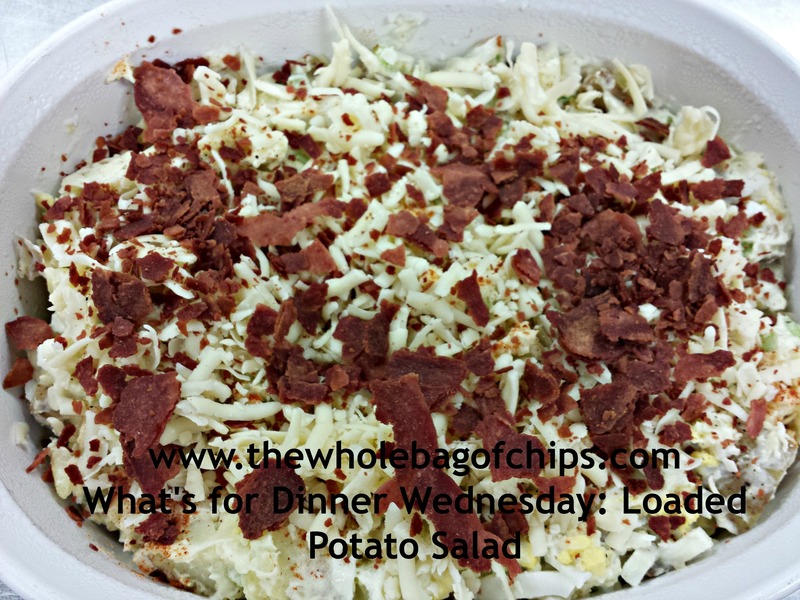 Are you a traditional potato salad person or would you walk on the wild side and load it up a bit? What goes in your potato salad? Are you a mayo person or is there some other ingredient that you choose to use instead? Do you use red potatoes or something else? Feel free to leave me a comment with your own potato salad secrets! In the meantime, hope you’ll hop on over to the Caramel Potatoes blog and take a look at their recipes! I always find their recipes to be delicious and inspiring!